Ostlers is a family run Orchard and Cider Mill. Set in the lush North Devon countryside close to Exmoor. 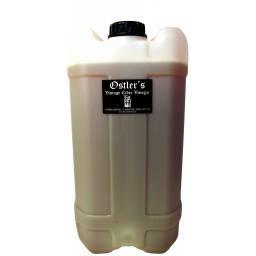 Our Cider Vinegar is made from freshly crushed apples which have been allowed to mature. It contains ‘The Mother’ which is the cloudy substance that is full of living bacteria, powerful enzymes and life giving minerals – as well as natural malic acid which is important in fighting body toxins. Our Apply Cider Vinegar has not been pasteurised or filtered. A superior vinegar on its own, as it has a rich, smooth apple flavour which can be used for; all your cooking, pickling, dressings, vinaigrettes and sauces. It could also be used as a natural cleaner and disinfectant. All of our Vintage Apple Cider Vinegar has been matured for atleast 10 years and is unblended which gives it a deeper and richer flavour, but maintains the mother and all great health benefits. A real favourite with the foodies! Due to the Vintage being matured for a longer period of time, we do not enter it into competitions as we only have a limited supply.